The physics of MRI technology are immensely complex, and there are several chunky textbooks out there explaining it all in great detail. However there are really only a few things you need to know as a medical student so that you can understand the basics of how MR images are created, and so that you can also understand some of the limitations of MRI. To get a better idea, you should watch one or two MRIs being performed when you are in the department. This is the 1.5 Tesla MR scanner in St Vincent’s Hospital. The basic components of an MRI scanner are the main magnet, three gradient coils and a radiofrequency transmitter and receiver coil. In essence, we use these components to evaluate the quantity and properties of hydrogen nuclei (protons) in the part of the body we want to image. 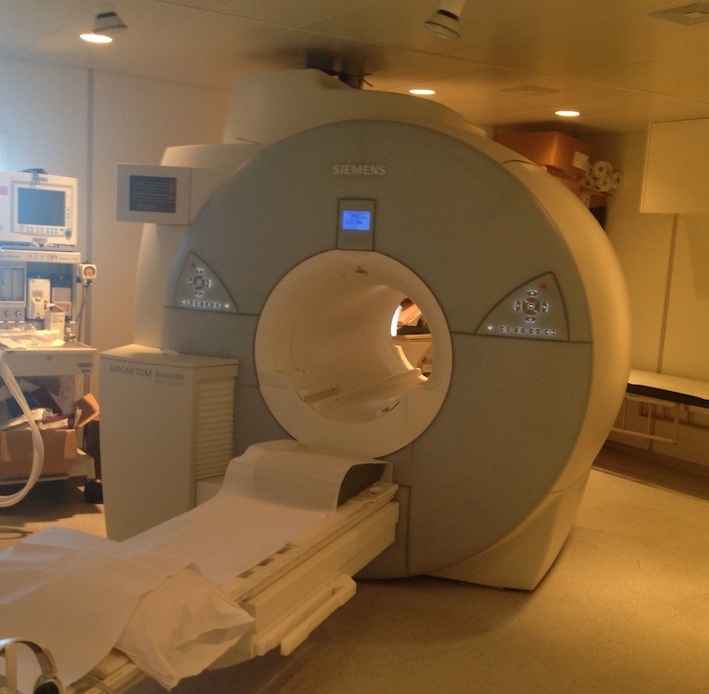 The main magnet in an MRI scanner is a superconducting magnet, which is always on. Typically, the strength of the magnetic field produced by these magnets is 1.5 to 3 T (Tesla). To give you an idea of how powerful these scanners are, 1 Tesla is roughly 20-30 thousand times stronger than the Earth’s magnetic field, depending on where on the planet you measure it. Most scanners in clinical use in Ireland are 1.5 T, although 3 T magnets are becoming more common, and there are some stronger magnets being used for research purposes (e.g. 7 T magnet in TCD). A photo of the scanner during an examination. Note how tight a squeeze it is for the patient – it’s not surprising that claustrophobia is a significant problem. The gradient coils produce smaller magnetic fields oriented in the x, y and z axes and therefore cause the overall strength of the magnetic field within the bore of the magnet to vary slightly depending on the position along the x, y and z co-ordinates. The gradient coils are what allow us to pinpoint specific parts of the body that we want to image. Unlike the main magnet, they are not always on. Instead they are turned on and off multiple times per second during scan acquisition. This produces a loud noise, like a pneumatic drill, which is the reason patients having an MR scan need to be given earplugs or headphones. This is a head coil, placed over the patient’s head for MR brain examinations. The radiofrequency (RF) coil acts to transmit and receive RF signals to protons in specific locations in the body. The ‘echo’ received from the protons in reply is very faint but can be better appreciated if a separate receive coil is placed closer to the part of the body being imaged. For this reason, we can get much better quality images if a coil is placed on the patient’s skin over the body part being examined, or around the head for brain imaging. The signal received depends on the so-called T1 and T2 properties of the hydrogen nuclei, which vary depending on what type of tissue (or fluid) the hydrogen is located in. These differences in T1 and T2 properties are what allow us to differentiate different types of tissue from each other on an MR image. Different sequences are obtained when the MR radiographer alters some of the parameters of scan acquisition, such as the timing of the RF pulses and the delay between sending an RF pulse into the patient and listening for the resulting echo. The basic MR sequences that are performed are T1-weighted and T2-weighted. If an image is obtained in which the differences in signal intensity between tissues are predominantly due to the differences in T1 properties of the hydrogen nuclei, then we have a T1-weighted (T1w) image. Likewise for T2w images. It’s usually pretty easy to tell these two types of sequence apart: fluid is dark on T1w images, while it is bright on T2w sequences (the way a lot of people remember this is to think of World War 2 (WW2 – Water is White on T2). For Breaking Bad fans out there, you can probably think of one that incorporates Walter White and the two ‘B’s in the show’s title. Fat is bright on both T1w and T2w, so it is not useful for distinguishing them. Pretty much every MR study will include an area that usually has fluid in it, allowing you to work out whether it’s T1w or T2w (for example, CSF in brain and spine studies, bile in the gallbladder on abdominal MRI, urine in the bladder on pelvic imaging, synovial fluid on knee MR). 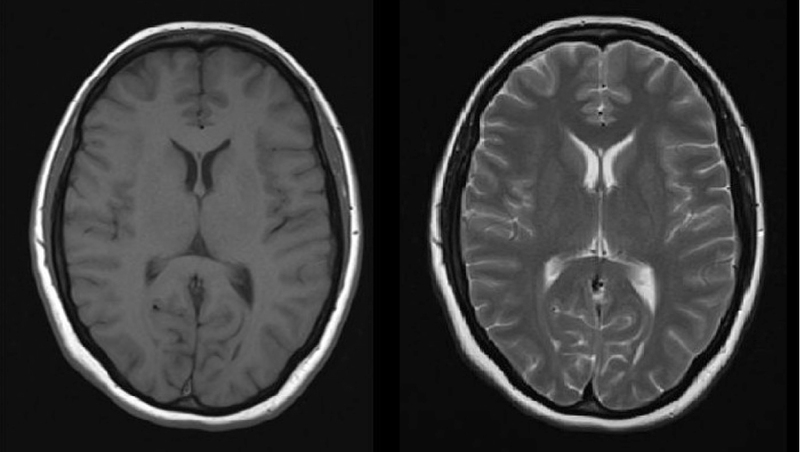 The left-hand image is T1-weighted, the one on the right is T2-weighted. To say that T1w sequences are good for anatomy while T2w sequences are good for pathology (commonly quoted by medical students) is essentially true but is quite an oversimplification. In practice, Radiologists use a combination of different sequences (at least four per examination, and often many more than that) to work out what’s going on. There are now dozens of types of MR sequence, but a few of the very common ones that we use in everyday clinical practice and that you should know about are illustrated below. You will see examples of all of these during your time in the department. 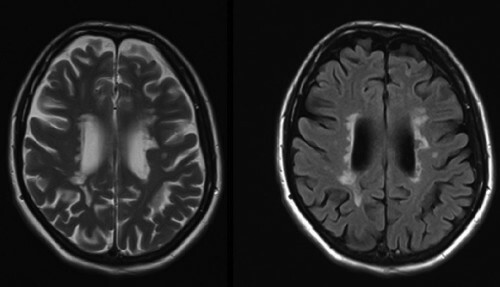 This sequence shows areas of abnormally restricted diffusion of water; restricted diffusion occurs in cerebral infarcts therefore DWI is a particularly sensitive MR sequence when looking for a stroke. This patient presented with right-sided weakness. 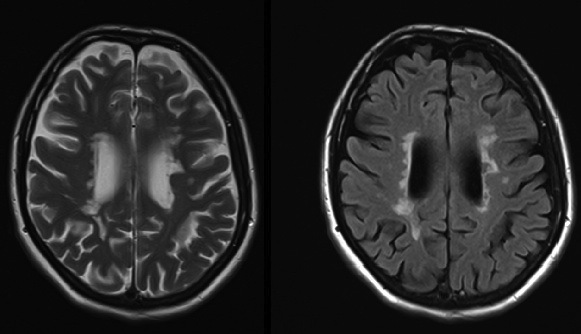 The left image is a FLAIR image (see below), and shows multiple areas of abnormal high signal in both cerebral hemispheres. These are all consistent with ischaemic changes – but could all be old. 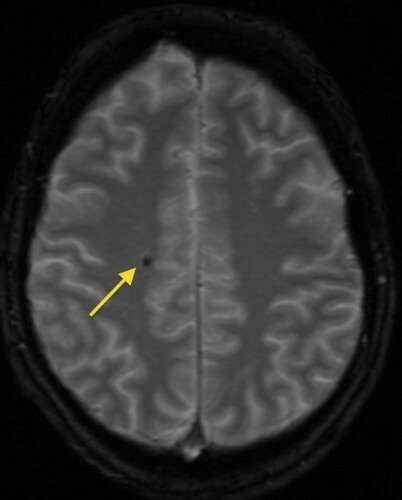 The DWI image on the right helps us by indicating that one of the lesions in the left frontal lobe shows restricted diffusion (arrow) and is therefore an acute infarct. In this sequence, used in neuroimaging, the high signal from CSF is suppressed. This makes pathological signal changes in the brain (especially adjacent to the ventricles, as we commonly see in MS) far more conspicuous. We use FLAIR in pretty much every type of MR brain that we perform at SVUH. These two images are taken from an MR study in a patient with multiple sclerosis. 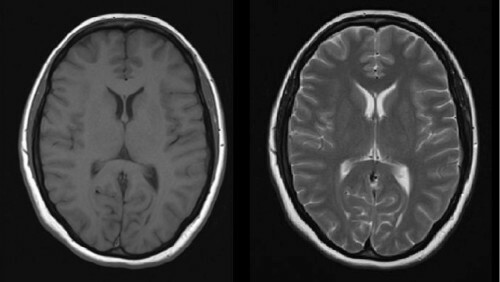 The left-hand image is T2-weighted – note how bright the CSF is. 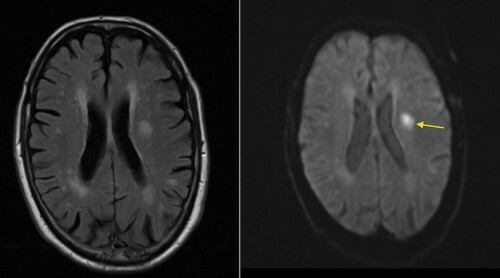 On the right is a FLAIR image of exactly the same location – the high-signal periventricular demyelination plaques are far more obvious when we suppress the signal from the CSF. As the name suggests, this type of sequence suppresses the signal from fat, making it dark. There are two ways of doing this; you don’t need to know how they work but you might as well be aware of their names. One is to use a process called fat-saturation. This can be combined with T1- or T2-weighted sequences, amongst others, in which case the sequence will be called, for example, ‘T2 fat sat’ or simply ‘T2FS’. The other method is called ‘STIR’, short for ‘short-tau inversion recovery’ (read and forget! ); we use this a lot in spine imaging. Fat suppression is especially useful when assessing the bones as it makes the fatty marrow dark, which makes abnormalities (such as bone metastases) far more conspicuous. The image on the left is a T2-weighted image from a spinal MRI in a patient with breast cancer. On the right is an image from a STIR sequence – note how the vertebral marrow has become dark now that the signal from fat is suppressed (also compare the intensity of the subcutaneous fat on the two images, yellow arrows). We can now clearly see three high signal lesions in L3, L4 and L5 (orange arrows), which are almost invisible on the T2w sequence, and which turned out to be metastases. When MR contrast (gadolinium) is injected into a patient, wherever it accumulates it interferes primarily with the T1 properties of any adjacent tissues. For this reason, whenever we give contrast we only ever do T1w imaging afterwards. When a post-contrast study is being performed, we carry out all the other types of sequence first (unenhanced T1w, T2w, FLAIR etc. ), pause to bring the patient out of the magnet, inject the gadolinium, and then perform post-contrast T1w (or T1FS) sequences. This sequence is routinely performed as part of our stroke-protocol MR brain studies. It is similar to a T2w image, but obtained using a different RF pulse technique. The end result is an image that is particularly prone to artifact from metal; ‘metal’ in this case includes the iron present in haemosiderin, which is left behind at the site of any recent or historic haemorrhage. Therefore we use T2* imaging to look for evidence of haemorrhage in a recent or an old infarct, which will appear as an area of very low signal. This appearance is called ‘blooming’. T2* imaging has obvious uses when clinicians are trying to decide if a patient should be anticoagulated. This is a T2* image, showing a small focus of low signal ‘blooming’ in the right frontal lobe, indicating a previous microhaemorrhage. There are more than a dozen different MR brain protocols in routine use in SVUH, with the appropriate one selected by a Radiologist on the basis of the clinical information supplied for each case. 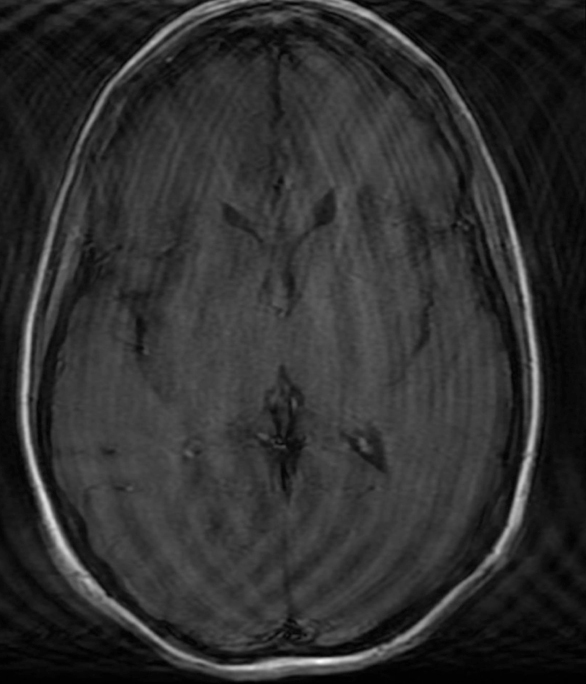 Some of the most commonly used are the stroke/haemorrhage protocol; MS protocol, which includes a sagittal T2-weighted sequence (to optimally display corpus callosal and pericallosal demyelination plaques); epilepsy protocol, which includes high-resolution coronal images to allow us to identify asymmetry of the mesial temporal lobes; post-gadolinium imaging, for suspected encephalitis, meningitis, cerebral or meningeal metastatic disease, or primary brain neoplasms; and internal auditory meatus protocol, which includes thin-slice high-resolution imaging of the cerebellopontine angles for suspected acoustic neuromas. 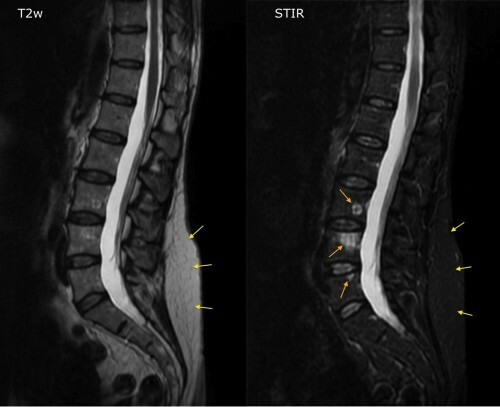 MRI is an excellent way of imaging the spine – there is no better imaging test when you want to look for disk herniations, nerve root compression, spinal cord compression, spinal cord tumours, ligament injuries in spine trauma, vertebral metastases and spinal infection (osteomyelitis or diskitis). Indications for this include the assessment of cardiomyopathies, ischaemic heart disease, valvular heart disease, congenital heart disease, cardiac tumours and arrhythmias. As you would expect, we perform a large number of these studies at SVUH. The main indication is the characterization of focal liver lesions identified on other imaging, for example US or CT, when we are unsure whether they represent metastatic disease, HCC, cholangiocarcinoma or some uncommon benign lesions such as hepatic adenoma. This examination routinely involves the use of IV gadolinium; a series of post-contrast MR sequences (arterial phase, portal venous phase and delayed imaging) is performed and usually allows us to confidently characterize the nature of the lesion without having to biopsy it. This uses a heavily T2-weighted sequence, designed to optimally demonstrate fluid (bile), while essentially suppressing the signal from the surrounding soft tissues. This examination does not require any contrast. The main indications for MRCP are the assessment of suspect common duct calculi (often missed at ultrasound due to the presence of gas in the duodenum), suspected primary sclerosing cholangitis (PSC), and suspected biliary strictures (for example, at the anastamotic site in a liver transplant recipient). The most common indication for this study, which assesses the small bowel, is in patients with Crohn disease. It is useful for the identifying sites of active disease, strictures, abscesses and fistula formation. This is frequently performed for the evaluation of uterine fibroids (including follow-up after fibroid embolization), assessment of ovarian neoplasms, local staging of rectal cancer and also for the staging of prostate cancer. MRI provides exquisite imaging of joints and is commonly used for the assessment of ligament, tendon or cartilage injuries in the shoulder, elbow, wrist, hip, knee and ankle. In some cases, most frequently in the evaluation of suspected tears of the glenoid or acetabular labrum, the MRI is supplemented by an intra-articular injection of gadolinium (performed in fluoro immediately prior to the MRI). Such studies are called MR arthrograms. The most obvious advantage of MRI is that it does not use any ionizing radiation, unlike radiography, fluoroscopy and CT. It provides very high soft tissue contrast which means that the use of a contrast medium is usually not necessary. MRI is a wonderful imaging tool, second to no other when evaluating certain pathological processes in certain parts of the body. However, it has a number of important limitations to be aware of. Some metallic implants can be adversely affected by the strong magnetic field; pacemakers are a particular problem (although some MR-compatible pacemakers are being developed), but there is a very long list of implantable devices which, when present, mean that it unsafe for a patient to have an MRI. When, in a couple of years’ time, you are qualified and are ordering MR scans, one of your responsibilities will be to ensure that any relevant history of surgical implants is provided with the scan request. Left image shows the warning signs on the locked door into the MRI section. 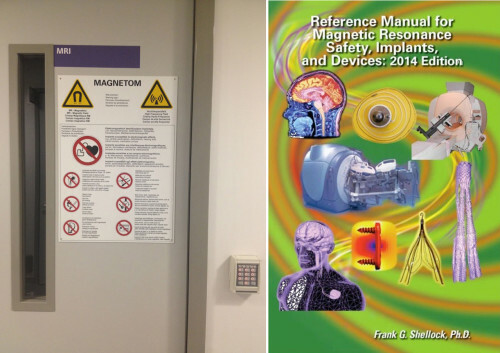 On the right is the cover of a several-hundred-page long textbook which lists all known medical implants and devices, and indicates whether or not they are safe in an MR scanner. 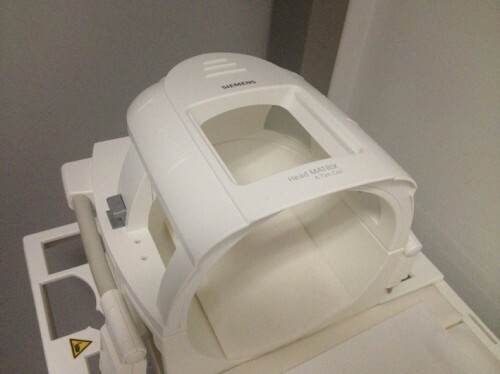 Another issue with metal is that any loose metallic items inadvertently brought in to the scan room by a patient or staff may become high-speed missiles; these items are drawn into the bore of the magnet and may cause damage to the scanner or, if a patient happens to be in there, they may cause injury or death. This problem has obvious significance when a ventilated patient from ICU needs to be brought in for an MRI; fortunately we have MR compatible support equipment which these patients can be switched to. Metal prostheses or orthopaedic screws are usually well-embedded in bone and not at risk of being displaced by the magnet, however they interfere considerably with the magnetic field in the tissues around them, and tend to result in large areas of ‘signal-void’ – black holes on the images, where pathology can be missed. This transverse T1-weighted image (the urine in the bladder is dark) shows large areas of signal void (arrows) around both hips, which are due to the bilateral hip prostheses shown on the CT scout image on the right. The signal voids are much larger than the prostheses themselves, meaning that we could miss pathology immediately adjacent to the metal. Another example of the detrimental effect of metal on MR images – in this case, it looks like half of the patient’s face is missing. This bizarre appearance is caused by dental braces. Claustrophobia is a significant issue affecting many patients, even those who have no history of it. 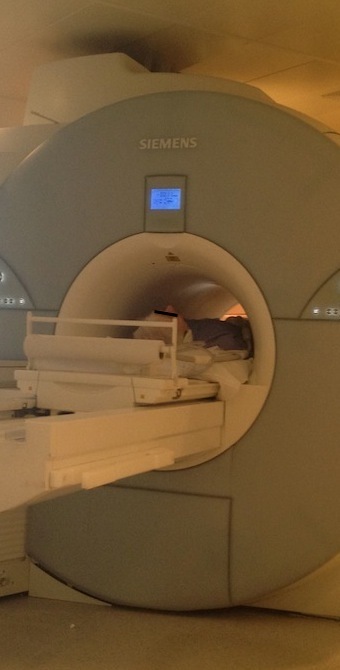 The narrow bore of the magnet, the length of the tunnel the patient lies in and the long scan times can make it a very uncomfortable experience. Patients are given an alarm button to hold during the scan which they can press at any time should it become too much for them, in which case the MR radiographer will take them out of the scanner. Several times per week we have to abandon scans because patients are unable to tolerate them any longer. 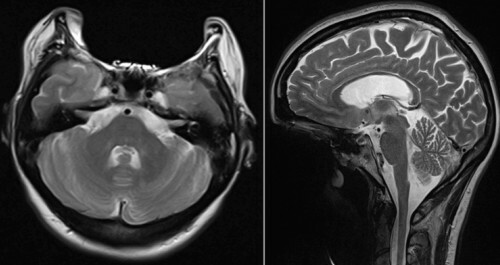 An example of motion artefact on an MRI brain image. MRI is very sensitive to motion; if the patient is uncomfortable and cannot stay still, image quality will suffer and in some cases the images will be useless. One of the reasons that this is a common problem is because of another limitation of MRI – the time required to perform the scan. In contrast to CT, where the whole body can be scanned in just a few seconds, the shortest scan time for a single body part on MR is around 15 minutes, while many of the more complex scans that we do (for example, liver and cardiac MR) can take up to an hour. Although it has yet to be definitively proven, it is likely that there are no harmful effects to the fetus from performing an MRI on a pregnant patient. The theoretical risks include the possibility of teratogenesis, and the risk of damage to the fetus’ hearing due to the noise produced by the gradient magnets. Teratogenic effects could theoretically be produced by either the magnetic field or the heating effect of the radiofrequency energy being deposited in the patient. 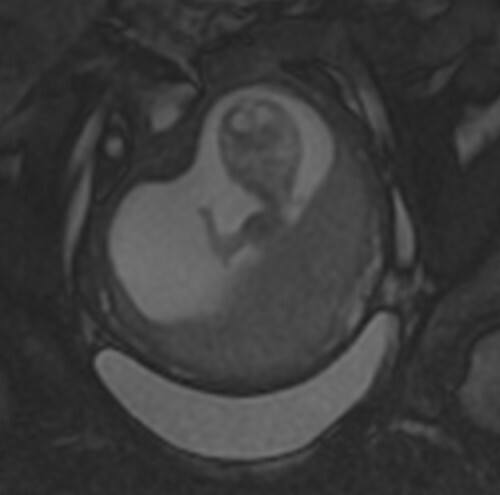 For this reason, the practice in most Radiology departments is to restrict MRI to pregnant women who are in their second or third trimester. 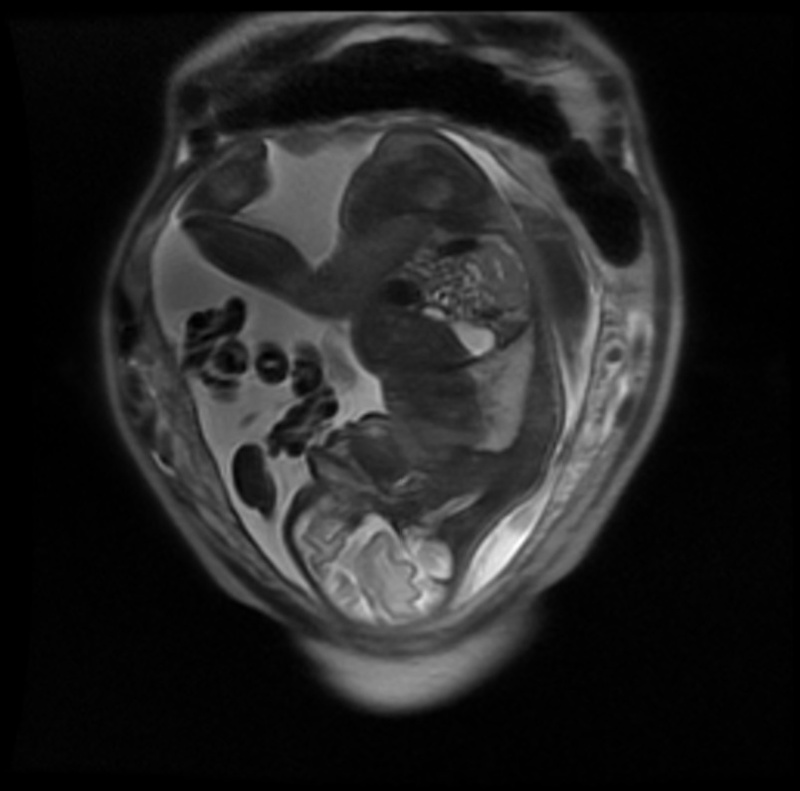 Having said that, MRI will always be preferable to an imaging study that uses ionizing radiation when you’re dealing with a pregnant patient, therefore we will occasionally perform MRI in the first trimester. Gadolinium is not considered safe for use during any stage of pregnancy. At St Vincent’s Hospital, we provide imaging services for the National Maternity Hospital at Holles Street, and as a result we frequently perform MRI for pregnant women for the investigation of abdominal pain, which can be difficult to clinically assess during pregnancy. This could potentially be due to acute ovarian pathology, acute appendicitis, acute diverticulitis or ureteric calculi, and MRI will generally allow a specific diagnosis to be made. Another MRI during pregnancy. This fetus is taking the opportunity to wave at the outside world for the first time. You can see a video of this here.